It was like turning the key for the last time to a beloved cottage…. Today, after fretting about it for a month or two, I cancelled my Premiere Membership to TORc. It was far more emotional for me than I had anticipated, even as the diehard fan I have been. I felt as though I had experienced a death. 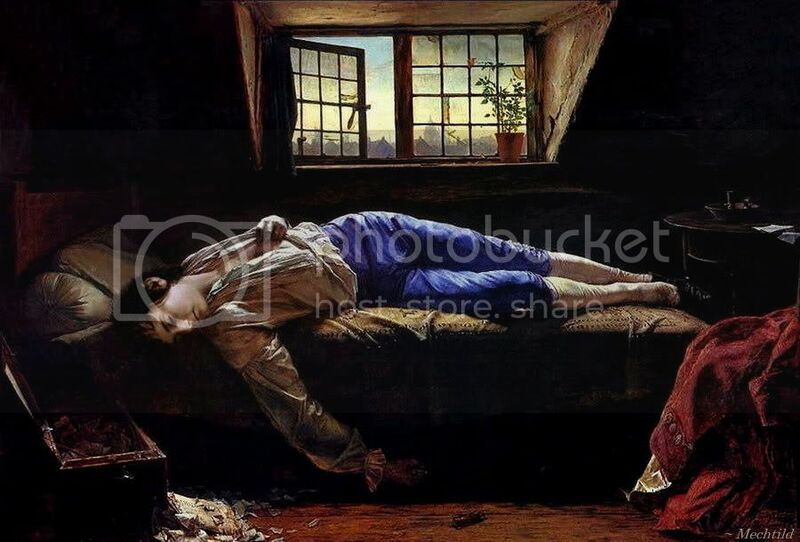 ~ Frodo as Chatterton by Henry Wallis, c. 1856. 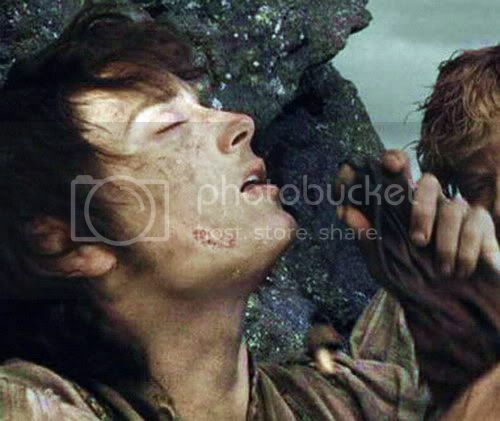 I had made this manip picturing the scene of Frodo lying in a swoon on his bed at the home of Farmer Cotton, longing, in his delirium, for the Ring. I entered LotR fandom (the only fandom in which I have ever participated) through a couple of Tolkien messageboards. I registered first at Tolkien Online.com (TORc), just before the release of The Two Towers. But I didn’t find it newsy enough -- and I hadn’t a CLUE as to how messageboards or threads worked. So, I did all my news-gathering at The One Ring.net (TORn). That was in November of 2002. But then came The Return of the King. Seeing that film (over and over) during the winter of 2003-04 so overwhelmed me, I was seized by the need to discuss it with others, who were similarly overwhelmed. I tried peeking again into the actual threads at TORn, but the ones I chanced upon were all lightweight and chatty. Then I opened threads in the Film Forum of TORc. There I happened upon some dynamite discussion threads, right off the bat, and soon was spewing my opinions and gushing with love for Tolkien (book and films) all over the place. That was in December of 2003. 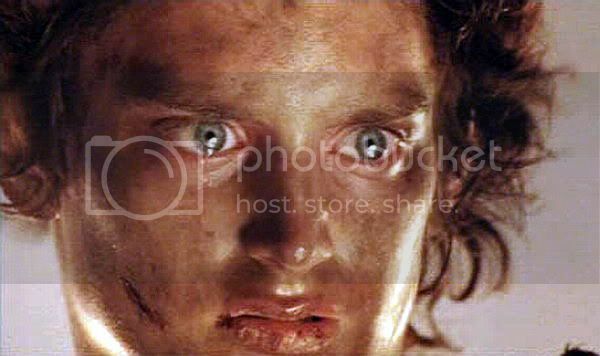 The next month, in January of 2004, I not only found myself even more immersed in enthusiasm for all things Tolkien, I also had fallen into mad, passionate love with film Frodo. Before that time, I had loved book Frodo, but in a platonic way. And, although I had greatly appreciated Elijah Wood’s performance as Frodo, both for his fine acting and for the sublime beauty of his face on screen in the first two films, I wasn't enamoured of him. It wasn’t until I had suffered with (and for) Frodo in RotK (over and over), that I became thoroughly and utterly besotted with film Frodo. Soon I became too swoony and gushy to post in the regular threads at TORc (a very intellectually rigorous place in those days). 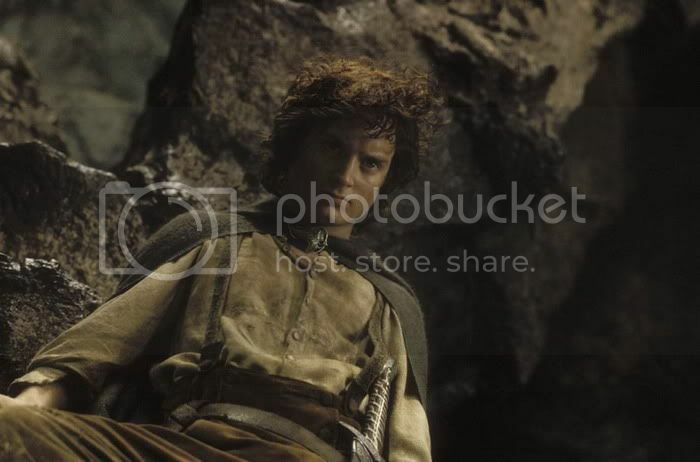 A kind TORcer (who became the “lead” beta for my fic) suggested I seek out TORc’s little swoon thread for Elijah/Frodo. The swoon thread at TORc resides in a little cubby in the [generally dismissed] Fandom Forum. I was a little embarrassed to show up there at first, knowing what a “low” place it was considered. (“Ugh! Faaaaandom!” real film forum posters would say -- after all, I was supposed to be an intellectual, not some fan girl.) But, soon I was gushing away, snorting and laughing over racy jokes, or waxing eloquent over the beauties and virtues of Frodo, those of the body and those of character. The TORc swoon thread developed into a very hospitable, swoony, but thoughtful little place to go. And, while we did talk about EW the actor, the primary focus was on Frodo, which suited me to a T.
All that winter I was deeply involved in the messageboards, in the regular LotR film forum, and, in the fan thread. That spring I read my first fanfiction. I entered into a friendly e-debate with a writer of quality S/F slash and, subsequently, decided I wanted to write my own fanfiction. I did, but I became so involved in it, my posting in the film forum threads dropped off to nearly nothing. I only made time to stay a “regular” in the swoon thread, with the exception of the gorgeous, “M00bies reads the b00ks”. It was in that way that I failed to notice the way that posting throughout the LotR film forum at TORc had dropped off, even before the Board 77 debacle. I just wasn’t there enough to notice. Not only was I writing fanfic, but I had become involved over at the K-D messageboard (Khazad-dum) in their Frodo swoon thread, “Frodo’s Harem,” and in the Elijah Wood-as-actor thread, “The Faculty Lounge”. In those places I have had a great time and met many truly wonderful fans and people. When I did notice the degree to which fans were folding their tents and going home, I thought, “Well, surely there still will be a little circle of fans left who still want to watch the films and pore over Tolkien’s books, and talk about the wonders they have seen (and still see), and tell how their hearts have been moved!” More experienced fans continued to warn me that it would not be so. I have been terribly sad to see the Frodo threads winding down, especially the TORc one, which has meant so much to me. I have tried hard to keep posting in it: writing little essays, making jokes, dragging in reviews and clips and links from all over the Elijah Wood internet-focussed world -- anything to fend off "the inevitable." But it just hasn’t been enough. The only “regulars” who post there are people like me: fans who already read and post in the far more active EW sites elsewhere. When we post in the TORc swoon thread, we tend merely to duplicate what we already have said in other places. What is the point in that? This past week or two, while The Faculty and the LJ’s have been fairly buzzing and humming with the Edinburgh festival and the GSH premiere, it has been dead as a doornail at TORc. In spite of the efforts of some of us to drag stuff about these events from everywhere else over to the TORc thread -- in links and pics and quotes -- it has generated almost no response there. There have been days (and weeks, it seemed) when I and one of my TORc swoon thread friends both made our obligatory daily post, putting on our “happy faces” for the thread as we did so. But privately we were emailing each other, crying on each other’s shoulders about how the thread had surely reached its nadir. “Oh, why do we keep flogging a dead horse?” we asked ourselves. A discussion community simply cannot work if there are not enough active participants. Yes, I have hated to let the TORc swoon thread go. I wring my hands, too, over the likely demise of the other Frodo thread where I hang out. How I have loved them both! But it seems they are fallen into decay – only a few dried leaves are left to tell of the glory and growth that once was there. No matter how many little skits or mini-essays we try to pump into them, it just seems to be inevitable. I wish I were more accepting -- especially since that is part of the message of LotR. It is silly, I know, but most of all I have hated the way the demise of the threads seems to reflect on Frodo, himself, as a character whom I love. I hate that “his” threads have turned into ghost towns. If he were to visit them, he would be reminded of verses from The Sea-bell. I shudder to think of it. I know, I know. He’s fictional, and I am being childish. But it seems to be part of my nature, not just childishness. As the wise-cracking Anthony Blanche said of himself to Charles Ryder, in Brideshead Revisited (in a rare serious moment), “I am a faithful old body, I am afraid, Charles.” I just have a heck of a time letting go when I have loved something. This does not mean I can no longer post at TORc, of course. (Having a “PM” entitles one to have a sig pic but not much else.) But maintaining a PM was a way of showing my commitment to the site and to LotR fandom. To have a PM was a public thing, and meant contributing money on a regular basis. To cancel my membership was an act of almost ritual significance, like striking my name from a baptismal register. Or, it was as if I were Gary Cooper in High Noon taking off my tin star and putting it on the dusty jail counter, and telling the unappreciative town leaders, “I’m not going to be your marshal anymore. Get yourself somebody else.” It felt very odd. But it did not make me feel free. It made me feel faithless. When I got to work immediately afterwards, I walked through the still empty library to my work space and started weeping. Not loudly; someone might hear as they came in for the day. But silently my shoulders shook as I picked up a stack of graphic novels and other “juvenile fiction,” and began to sort it, not even seeing the covers. It was as if I had cancelled my fandom, somehow. All the great threads I had loved at TORc came to mind, as well as the people who wrote the great posts in them. Although I had met none of these people in real life, their thoughts and feelings lived for me from the pages displayed on a monitor. How much I had learned! And how happily I had wallowed in a tub of love and ideas and soaring enthusiasm! Well, it is the night, now, and I am feeling much better. I have thought about it a great deal and feel far more prepared to do without it. I am prepared, now, to go back to separating my enthusiasms. In order to keep in touch with fellow swooners, I am hoping LJ-land will be the place to do that. Also, I have email addresses for my friends at TORc. And, happily, I like EW very much – much more than I did starting out – for it seems that I will be able to find many Frodo fans gathered at his various shrines or cheering on his latest film projects. As for serious discussion, another poster told me all about going to the recent Tolkien Society convention. Her excellent little report on the presentations there made me think there was hope yet for a place to read and discuss Tolkien’s work and world in a thoughtful, engaged way. They must have a website. I am sorry this has been so long (if any of you are still reading it). I just can’t dump all this on the TORc thread. Some of the posters who drop by there are just nice people who want to stop in every now and then and say how much they like Frodo or Elijah Wood. Why should I make them feel bad with all my, “peeing and moaning” (an expression of my English mother's)? Some of the RotK scenes in which Frodo “got me”…. How very sad...I got teary as I read that post. But I understand why you did it..and like you said it doesn't mean you can't continue to post there. I do hope you find some solace in the fact that KD is still going strong,although The Faculty is more Elijah driven then the Frodo driven theme that moves your soul. We do love you on that thread. Your manip is truly spectacular...one of the best I've ever seen. I never save manips...this one is the first one that is too good to pass over. Thanks for sharing that! Yes, Maeglian, we have talked very much, and with much hand-wringing about the dwindling of The Harem. You have been a faithful, inspiring and entertaining light in that thread, and I have appreciated your input immensely. But the TORc thread is past the "dwindled" state. One just rattles around in it, and it was tiny to start with! I mean, if a so-called Frodo/Elijah thread can't even get excited about EW's latest premiere, it doesn't look very encouraging. I am not saying NO ONE is excited there; there just aren't enough of them to make it a viable thread. I don't count the sort of people I mentioned above, those who post there, but who are only duplicating what they have read and said elsewhere -- mainly in The Faculty (people like me). After my tenth link to The Facutly in half as many days in the TORc swoon thread, I had to say to myself, "For heaven's sake! Why don't they just read The Faculty, and skip the bloody middle man?!?!?!?" I have much to say on this subject, having been a member of Council of Elrond and TORC for five years, and KD for three, and having seen quite a few meltdowns, squabbles and fallings-out. I am a seasoned messageboard survivor!!!!!!! I see you snagged one of falling silver's gorgeous icons. Heh. "I see you snagged one of falling silver's gorgeous icons. Heh." You showed it to me, cute'ums. Don't let them do it too short, y'hear? Mechtild, It's a sad, but true saying that "all good things must come to an end". It has been a pleasure posting with you (and probably still will be for a while in the future) in TORC. I'm not sure if I've told you this before, but it was you who inspired me to make my first post in TORC - in the Frodo/Elijah thread. I had thought I was too old to become involved in "Frodo/Elijah swooning" at my age, especially with two sons who were around the same age as Elijah, but when I saw you were in my age-group, I thought, "If she can, so can I!" So this quiet and shy individual did, and has never regretted it! It's been a very enjoyable 18 months posting with you. It changed my rather lonely net surfing for LOTR-information into an exciting, and something to be looked forward to, activity every night. Back when I joined, it was vibrant and the multiple posters would bounce off each other with hilarious posts (many of them instigated by you!). We had our "theme" weeks, where people with sigs would post new sig pics in line with the current theme. I didn't have a sig at that time, so I'd post links to appropriate pictures. Those were the days! However it's become very poor of late. I've not posted there as often as I should lately, either. There's not much to say except, as you pointed out, to pass on pointers and links to K-D and LJs with news of Elijah's movies and appearances. The life has gone out of it. I will continue to post on the Frodo/Elijah thread in TORC when I feel I have something to say, and I frequent other threads there too. As you know, I have been very generously gifted (anonymously) with a membership, and I will continue to display my sig for a few more weeks at least! Maewyn, good morning, and thanks for speaking. I have so much appreciated the way you were willing to hang in there and give it your "college try." And, yes, I am sure I will still post there, but I won't put the kind of effort I did into all this time, especially these last several months. I am going to try and just let it be whatever it is going to be. Perhaps it will, in a state of relative dormancy, actually attract a new set of posters, looking for such a home with room to spare. As for being to old, I must share this image with you. I was looking in kindling's LJ (hers is a strongly-EW centered LJ), to ask if I could use one of her racy icons that really makes me snort. (See bottom of post.) While I had her User Info window open, I saw the following image. I traced it to its source on the web, and it is from an artist named Anne Tainter. Her specialty seems to be affixing amusing texts to older photos, mostly from the forties and fifties. Here's a link to her site: there are many humorous gems. I found the one kindling had used. 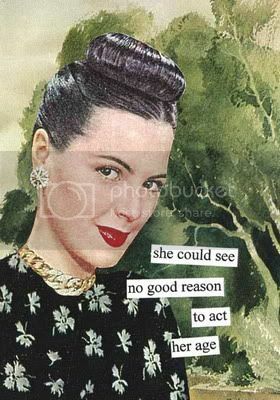 I found it at Anne Tainter's site under, "Cards." P.S. The icon in this comment box is one from an icon maker Pearl pointed me to, pocket_icon. She has many, many great icons, not just of Frodo. I haven't been to the Harem for a long time, and I must get back there. Now RL is sorting itself out for me at long last, I am a free hobbitlass!!!!! And LJ is such fun too!!! Sorry I am talking rubbish, mind wandering in relief!!! LOL. Thanks, bagendbabe. ((((Hugs)))) right back to you. I am feeling restored this morning. I hope your summer has been WONDERFUL!!! It is silly, I know, but most of all I have hated the way the demise of the threads seems to reflect on Frodo, himself, as a character whom I love. After all, all the movie/fandom forums have slowed down sooooo much. The m00bies forum at TORc was already fading to its twilight before the disastrous temper tantrum by the TORc admin in March this year which resulted in a large part of their messageboard community being virtually decimated. As for threads like 'Frodo's Kitchen' at TORc, and the Harem thread, these were unique in the fandom because they combined several elements: an abiding love for book Frodo, an ecstatic passion for film Frodo, a deep knowledge of Tolkien's books, an appreciation of Jackson's films and a strong sense of community. All the women in these threads bonded closely and formed unique communities. They were always more than 'just' swoon threads. I must also say this: once the community aspect starts to play as vital a role in the thread as the debates and the swooning, tensions start to appear. This is inevitable when you have so many strong personalities with decided opinions about the films and the books - not to mention fanfic!! I do think that Golden Ages cannot last forever. Posting slowed down once the films were over. Posting slows anyway when it's summer (we should be out in the sun rather than sitting at our keyboards.) My posting has slowed because RL is becoming more pressing than cyber-life. That's probably a good thing. And I end up just repeating stuff I've said a million times already, about Frodo the book character and Frodo the film incarnation. These days I'd rather retreat to a quiet corner and write fanfic. Even writing fanfic has been hard to do when the messageboards have distracted me so much in the past. I hate that “his” threads have turned into ghost towns. If he were to visit them, he would be reminded of verses from The Sea-bell. I shudder to think of it. *sniffle* Oh, but don't think of it that way. Think of it instead as the Haremites having left and taken the Straight Road with Frodo to the West, where the leaves do not fall and where our beloved Iorhael can abide in peace and quietness in 'Arda Unmarred'. "And my love for Frodo is part of my love for LOTR, and neither of these things can fade, because my favourite books always become part of me: part of my life, my dreams, my soul - LOTR most of all. Tolkien (like C.S. Lewis) is a hugely influential writer on the way I see the world - so much in his philosophical Catholic worldview resonates with me. The nostalgia and melancholy in Tolkien's work, that yearning for a Paradise Lost, really resonates with me ..."
*Smooch* Thank you for helping me see it in a better perspective. Better because it is both true and beautiful. Yes, the boards have been terribly distracting for writing fanfic, but they have been very nurturing and inspiring, too. Just as in real life, strong relationships take a lot of one's time and energy, but, without that investment, the relationship simply does not come to fruition. And you are right about strong personalities clashing. I have certainly seen that happen. It did not happen on the swoon thread, however, since it was mostly just for fun. Ah, The Kitchen; what a place! I barely dared to lick its tiles (picking up a few stray bilberries), but it was a fantastic combination of everything I craved and was fired by. It spoke to the "whole fan." Mind, body, spirit, heart, everything. But, yes, I could see it had its lifespan and then expired. When I get a little distance on it, I will come to see that about the other threads I have loved. "Think of it instead as the Haremites having left and taken the Straight Road with Frodo to the West, where the leaves do not fall and where our beloved Iorhael can abide in peace and quietness in 'Arda Unmarred'." Oh, SOB, Pearl. I am getting all teary. Not from whingeing from the poignant beauty of the thought you expressed. No wonder you were nominated for "Light of Earendil" or whatever that was at TORc. Aw Pearlette, that is gorgeous. *smooch* That's one beauty of an icon too. Perhaps there will be a boost in the book and film fandoms when Peter Jackson releases the extended extended version of LOTR. There's to be an, "extended extended version of LOTR"? You're joking. I thought they threw in everything but the joke outtakes and the audition tapes. There was more film footage they would have used, really? I actually do remember reading an interview with Pete jackson in which he said he'd be interested in releasing the films again when high definition is available on DVD, but I didn't think he meant to change the films themselves any further. Thanks for the hug, Estë. I truly am feeling chipper. Pearl's exhortation, especially, helped me look at it all from a more helpful perspective. I'm not sure if you remember me from Frodo's Kitchen, and I also was an active Faculty member for quite a while (though not so much any more) under the name Estella Rose. I was aimlessly wandering through friends flists, saw your post and thought I'd say hello. I don't have anything I could add to the Wisdom that is Pearl's, but I do understand your melancholy. It is sad to realise that things have changed, that it's time to let go a little. I also cancelled my Premium Membership not so long ago, and it felt like I'd crossed a bridge in some way. I am very grateful for LJ as a way to stay in touch with so many people, as I treasure the bonds that have been created through our shared experience of the LOTR books and films. Thank you for posting, Samaranth. I have thought you seemed familiar when I have been in Pearl's LJ. I came into Frodo's Kitchen rather late (as I came into everything!) and was there for one last surge of discussion in the early spring of 2004, and then it sort of petered out. Marea (I think) tried to drum up some interest afterwards, or, I think it was Marea, and some of us traipsed back there a few times, but, again, it was like flogging a dead horse. It simply would not get up. I think that, already, the backbone of the Kitchen's posters had departed from TORc. Once that core group had all gone, the thread was too vitiated to go on; it just sort of deflated. But, what a thread it had been! Before I made my first post there, I read through all of the second thread (they were on their third by then, I think). It was great. And "old timers" said that the part one of the thread was better still. I am encouraged by your remarks above, Samaranth, and truly have hoped I might be able to continue to develop conversational relationships with other fans on LJ. That was why I broke down and registered for one. I was just terribly worried that the threads would fold altogether, and I would find myself stranded. People on LJ have been very welcoming and I have appreciated that. Still, it's a big and rambling place. I have only begun to look around on it. As for The Faculty, I only began lurking there on and off late last spring. I can't be sure I remember seeing your name or not; every name was strange to me! I don't post in there very much since I am not nearly as keen on Frodo's actor as I am on Frodo, but I really do like Elijah Wood a lot. In fact, I have liked him increasingly as I have got to know more about him. I really, really hope these new films pan out for him. He needs something that audiences can love him in. To me, his roles in his other post-LotR films have not come close to providing that sort of opportunity for him. Oh Mech, I know exactly how you feel. I see there have been many responses to your post, and I must admit I didn't read them all, so forgive me if I'm merely reiterating what others have already said. That being said, I feel the same way about the Frodo thread at ToRC. I'm not good with accepting change or letting things go, and so, even if I have nothing useful to contribute, I feel the need to visit the thread and make my presence known. Almost just to enforce my dedication to both Frodo and Elijah Wood. Otherwise, a terrible feeling of guilt for not declaring my devotion is bound to ensue. And as you've said, posting there has become a duty, and it too makes me very sad. I miss the excitement and anticipation of the new films--the thrill and newness of the characters and the visualized world. Unfortunately, things do change, whether we like it or not,and I am glad that we have LJ so that even if ToRC "goes under," we'll be able to keep in touch. But, as far as Mr. Wood goes, there's EII yet to come... that gives us a bit of fuel. I like you, was ashamed when I first set foot into Fandom, but thanks to posters like you, I've found it to be a pretty darn intellectual place! So, like they say, all good things come to an end, and although I think we still have a bit of time left, it's bound to happen, and when it does I'll be so thankful for the experience and meeting all of you ladies. Oh, Bree, I am so relieved to hear you say this. You were one of the people I wanted to "hang on" for. But you were feeling it, too. If you have time, read Pearl's longer post above (a couple of responses follow). She was "Diamond of Long Cleeve" at TORc, and one of the "lights" of the Movies threads and in "Frodo's Kitchen." She began beta-reading Threshold starting with Ch. 8. As you will see when you read her post, she is a wise, percetive, caring friend to Tolkien and Frodo lovers. *smooches* to you, Bree! And if you ever need EW news, keep lurking in The Faculty, and in the LJ's that specialize in "Wood lust" (yes, there even is an LJ user whose name is "woodlust"). Awwww, Mechtild, I feel bad for you. And I feel guilty because I was one of the first rats to desert the swooning thread, back when TORC's golden age began to fade. Still, you can't force people to keep talking if their intense interest/obsession has waned. In my case, I simply had nothing much to say – plus, as you know, my other fandom stole my attention and time. It doesn't mean my love for Frodo is any less; it just means he's not at the forefront of my mind and on the tip of my tongue (or typing fingers). I've been feeling nostalgic for TORC too, the last few days. The death of thediamonlucifer has hit me quite hard, and I've been remembering his wonderful posts and all the other luminaries of the Movies forum. Many of those people are still active on Board77 or in LJ land, of course, and it's a comfort to know they're there if I want them, but those heady times when the LotR movies were being anticipated and dissected are gone. I went looking for the "For the Emotionally Wrecked" thread recently (remember that one?) and it has gone too: must have been archived – or deleted. Now why was I searching for that ... Oh, that's right, I'd been reading Fool's Errand (by Robin Hobb) and sobbing my heart out as though Frodo had taken ship again. Nighteyes gets me like that. Ooooh, new person to friend. Hey, girl! Thanks for the sensitive comment. You are right -- we were there, Lembas, during the heyday. I guess I should stop whining and just think of myself as fortunate to have gotten in on it. Have you started classes yet? Are they better this year than last?